Last week we looked at a 6-hourly chart of the gold price using the technique of Chart Symmetry to identify preferred gradients, i.e. gradients along which a price is more like to make trend reversals and trend changes. Preferred gradients can be found using software that can generate accurate trend lines and also various derivatives of a master trend line, such as a true parallel or inverse, as well as trend lines whose gradient differs by the Fibonacci ratio from the master gradient. All the lines that can be generated on a given chart beginning with a given master gradient are known as a ‘family of trend lines’ and any one of them can be used to generate the rest. While Chart Symmetry is highly accurate, this does not mean that prices obey preferred gradients at all times; false breaks develop quite often, where a false break is taken to be a penetration of a trend line that soon reverses again leaving a ‘spike’ to protrude beyond the line. Such ‘spikes’ or false breaks generally will be found on further analysis to have reversed on another preferred gradient that was not included in the initial analysis. Multiply (or divide) the gradient of the master line by the Fibonacci ratio (0.618034) to deliver a line that is steeper (shallower) than the master line. This process can be repeated, using the newly derived gradient, to result in a whole fan of lines that have gradients separated by the Fibonacci ratio. The analysis last week showed that the gold price had just rebounded off support on its 6-hourly chart into what is starting off as leg 5 of a large triangle. If the triangle should complete normally, as happens in about 80-85% of cases, this implies that gold is at the beginning of a major new bull trend that should take out the recent highs. Applying the standard rule of thumb for triangles – that the move out of the triangle will equal the length of the ‘flag pole’ on which the triangle is suspended – results in an anticipated move of just short of $53. That delivers targets of $396 or $419, depending on which is used as the starting point; the start of leg 5 or the point where the price breaks upwards through the top boundary of the triangle. This is very similar to the analysis shown last week. The same master line, M, is used, with I the inverse and lines A, Y, F, F2 and R also appearing in last week’s analysis. Lines B and X have been shifted from where they appeared before, and line S is added. It is vital to observe that only the master line is defined between two points on the chart – all the other lines were derived from the gradient of the master line, i.e. if these lines appear to fit the reversals on the chart it is because they all represent preferred gradients. Patterns of interest are the large triangle, A-Y, and the megaphone, F-F2, as well as some channel formations. We can now see that the price has started on what could become leg 5 of triangle A-Y and that – so far – the price has not broken lower below Y to reach the next support line, parallel to Y, that was shown in the previous analysis. Observe that the break below line Y at the end of leg 2 of the triangle is what is known as a ‘bifurcated break’ – a pattern that develops along the outside of a pattern boundary and acts as a reversal pattern. This is not considered a true false break and does not affect the count of the legs within the triangle. Line S is parallel to the master line and also to line R that acted quite well as support for leg 3 of the triangle. If line S were to play a similar role to that acted out by line R, it should become the main support of leg 5 of the triangle and take the gold price higher to beyond the top of the triangle at line A. It would also ensure that the trend is quite steep for the next few weeks. Note that the move along leg 3, from the first rebound off line R until line A was reached required 22 trading days – just over a month – to gain $50. The table of prices on the chart is the line values for 1200 SAT on 7 July and – as the chart itself – represents the middle of the bid-offer double.. This chart shows detail from the initial analysis, covering about 5 weeks of history. If one considers that the gradients of these lines are derived from that of the master line that was generated between points located in December ’02 and February this year, then the close fit that is obtained across a number of different gradients is exciting. The next day or two is going to be quite critical for the near term development of the gold price. The price ended on Friday right on the key support line, S, which should hold if the price is to sustain a similar steep gradient to that it followed previously along line R.
Early in Asia gold traded down to $350.60 in the middle, which was hinting at a break below line S if the price had still been there at 0600 SAT. However, it had moved up to $351,70 by the time of the next reading, which is clear of the $351.10 support level at S.
Three support levels are now in play: $351.10 along line S; $349.70 along line B and then $344.80 along line Y. If the gold price can hold along line S for the next few days, it may establish enough momentum to repeat its earlier performance along line R. That should see a break above triangle A-Y within 10 trading days at most; if the price should move higher off line S, the break could come before then. Failure to hold the steep gradient of line S would bring line B, the bottom boundary of channel A-B into play as the next key support. The gold price need not return to line B, but after breaking below line S could continue rising at a slower pace.. If, however, line B is tested and fails to hold, we face the prospect that the gold price could return to line Y again, taking the price down into the mid-$340’s. So far so good; gold is holding to the steep gradient of line S and, having started off well on leg 5 of triangle A-Y, has prospects of breaking above line A in due course – perhaps within the next 5-8 trading days. We all know that the gold price is being shunted around – whatever term one wants to apply to the action and to the parties responsible. 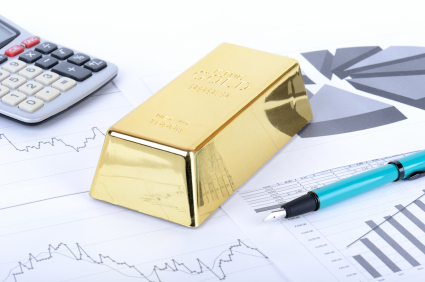 The question asked in last week’s essay was rhetorical – aimed at the school of thought that because of manipulation the gold price is no longer a good subject for technical analysis. The accuracy of the analysis – seen from the detailed chart – based on preferred gradients and a six-month old master line, show that the behaviour of the price remains true to the preferred gradients despite the intervention. This does not imply there is no intervention; just that the intervention ‘adjusts’ the gold price within predefined chart patterns. For example, ideally the price should fit within the large triangle A-Y without breaking outside the boundary lines. Yet at the end of leg 2 and the start of leg 3 we find that the bifurcated bottom developed on the outside of the pattern. It is not known whether that break was a serious attempt to take the price below $320, which it briefly did to form the very small double bottom at $319.90 (a pattern that is also a small bifurcated break below line Y in last week’s analysis. ), but if that was the intention, it may have failed because of the presence of the triangle A-Y that was under development – presumably and hopefully as a large continuation pattern with a target in the vicinity of $400, or even higher. Time will tell, but the future for gold is now looking even better than last week.